I am quite sure that many of us have heard the expression “Money cannot buy happiness”, but it certainly can do a whole lot to lift up one’s mood, as well as help us roll back the years in terms of bringing back the memories of the past. With the $2,500 Genuine Good Humor Ice Cream Cart, you can be sure that those who have had pleasant childhood memories of the local neighborhood ice cream cart will be able to identify with this bad boy. 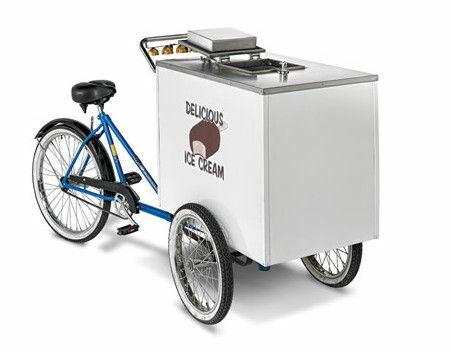 The Genuine Good Humor Ice Cream Cart happens to be the real deal which was made by Worksman Cycles, where it was first produced for the Good Humor company more than 75 years ago. A quartet of brass bells were made by the original manufacturer, The Blevins Bell Company, and they will hang from the handlebar which happens to be a memorable iconic feature that attracted children by the dozens to street corners in America’s growing suburbs after World War II. This purchase would arrive in the original color scheme of a blue frame and white cabinet without losing any of its heavy-duty construction capability. What ice cream are you going to put inside though?